A gorgeous new pair of wings are waiting to join your collection! 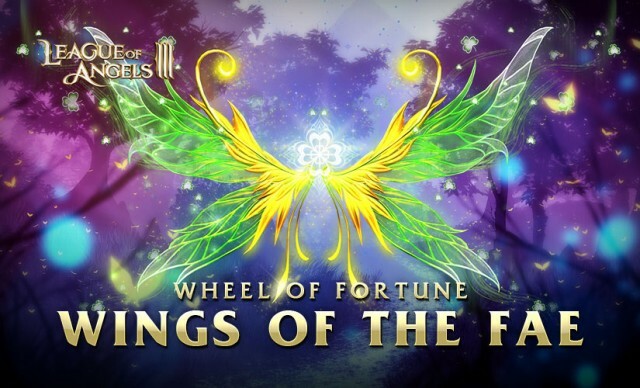 The Wings of the Fae is the holiday exclusive item that can be obtained in Wheel of Fortune from March 19th to March 21st (both permanently and 3-day versions). Don't miss your chance to get these vibrant wings to celebrate St. Patrick's Day with your friends! Wings of the Fae is a gorgeous, luminescent pair of wings from the mystical fairies that represent beauty and rebirth. Glowing with vitality to usher in the spring bloom , these wings feel right at home in Fairy’s Coming. Once you unlock the new wings, you can gain over 60k Battle Rating, and they are a perfect match the new Song of Life outfit and Seat of Fortune mount! Don’t miss the opportunity to unlock the limited holiday fashions before the event ends! 1. New limited holiday Wings – Wings of the Fae which can increase your BR by over 60k and grant a huge amount of bonus HP (+28k), ATK (+8.4k) and DEF (+5.6k). 2. Enhance your Equipment and get more Gems. During the event, you can claim Gem Chest from Lv. 4-7 and Creation Equipment materials when recharging specific amounts. 3. Get more tickets! When completing specific tasks in the game, you can earn more WoF tickets to spin the wheel. And VIP players can directly buy tickets at a great discount. 4. More rewards! A series of rewards can be claimed when you spin in Wheel of Fortune enough times, especially for players who have a desire for Gem Lv. 5-7. 5. Huge discounts! Find the new wings too hard to get in Wheel of Fortune? No worries, you can also exchange for them using lucky coins at a great deal. And if you missed the Seat of Fortune last time, you now have another chance to exchange for this special mount in the Wings of the Fae Sale!